Dyma siawns i ddysgu am y brwydrau yn erbyn carchardai ar draws Lloegr, Cymru a’r Alban gan yr Empty Cages Collective http://www.prisonabolition.org ac Community Action on Prison Expansion http://www.cape-campaign.org. 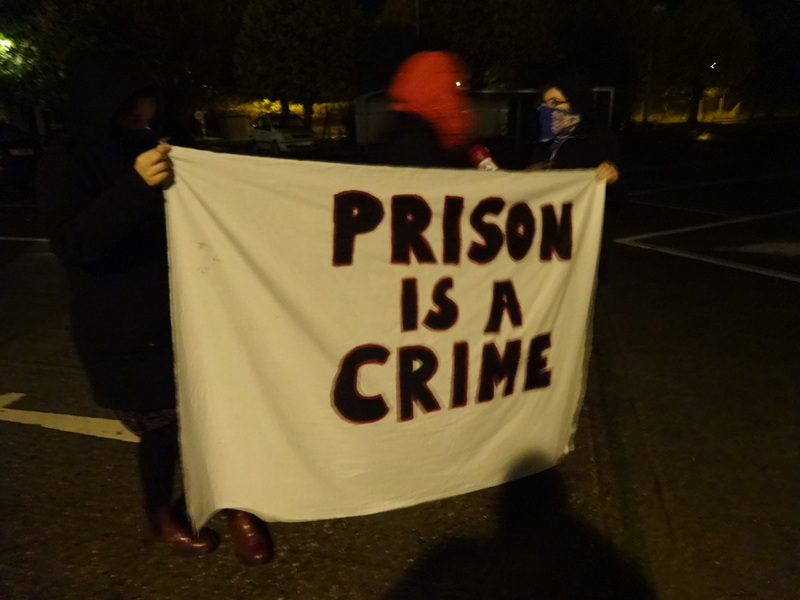 After this years London Anarchist Bookfair South Wales Anarchists bus went to HMP Send on Saturday night for a Noise Demonstration outside this womens prison. People chanted calling for prison abolition and shouted cheers of solidarity. Prisoners waved back, it was great to communicate through the prison bars. On leaving the demonstration local screws not in uniform (one claiming to be the Governor) assaulted two women that attended the Demo. The three of them were spoiling for a fight. They blocked the road in an attempt to prevent the bus from leaving but it seems that after they discovered that the Police had no intention of coming, after around half an hour they had to let us leave. During the course of their interaction with us, they said to us ”Haven’t you heard them all kicking off on J wing?” and scolded us with “Dont you know how hard it is to control them in there?”. Needless to say hearing them say that almost made their irritating attempt at a citizens arrest worth it. Am y fersiwn Cymraeg cliciwch yma. 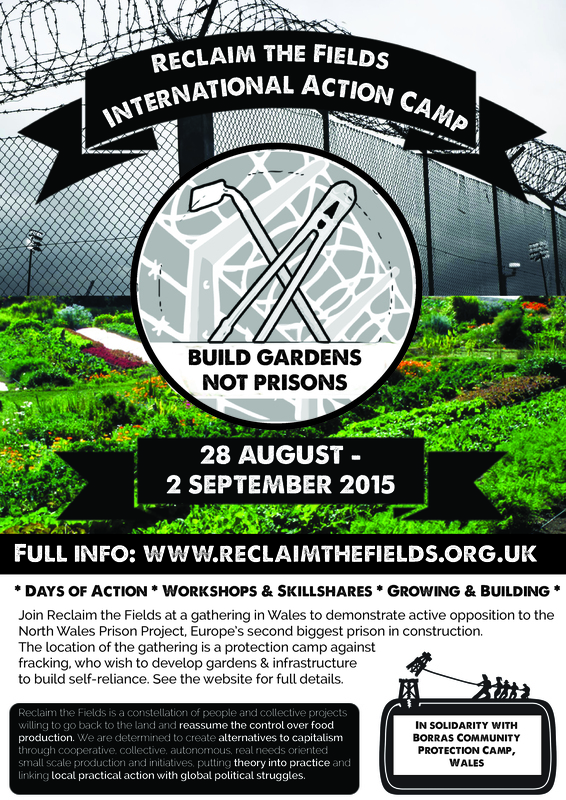 South Wales Anarchists will be participating at this camp. Reclaim the Fields (or RTF) UK was born in 2011, as a star in a wider constellation of food and land struggles that reaches around the globe. Since 2011, camps and other RTF gatherings have helped support local communities in struggle, share skills, developed networks, and strengthened the resistance to exploitation, in Bristol, west London, Gloucestershire, Nottingham and Fife among other locations. Every two years there is also an international camp, where people from around Europe and beyond meet together to support a local struggle (from gold mining in Romania to open cast coal mining in Germany, for example). People share share stories and ideas about resistance and reclaiming our food system beyond national borders. This year, an international gathering will be held in in Wrexham, Wales. 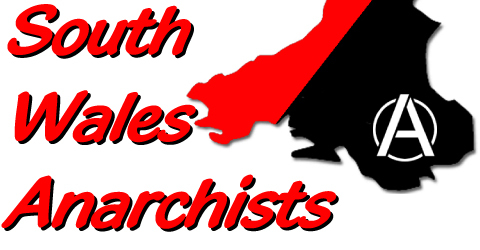 Actions – demonstrations & actions against companies involved in the construction of the North Wales prison, as well as local fracking-related targets. 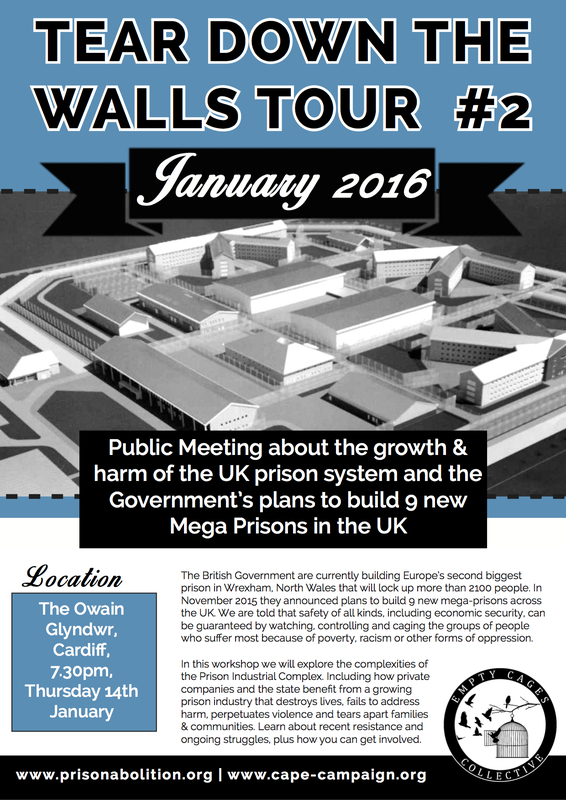 Everything from solidarity demos at local prisons to leafleting on Wrexham highstreet. Workshops & Skillshares – Over the bank holiday weekend there will be abundant opportunities to learn, share, discuss and connect with other people. Building & Growing on the site – Be part of installing gardens & low impact infrastructure at the community protection camp. Learn about permaculture, agroecology, forest gardening, mushroom growing, pallet construction, compost toilet making, off-grid electrics and more. Why this camp? Why now? Support with publicity before the event – sharing the gathering online, putting posters up, encouraging your local group to get involved. People are also needed to help design the programme, respond to emails & plan facilitation. Who are Reclaim the Fields? We are a group of peasants, landless and prospective peasants, as well as people who are taking back control over food production. We understand “peasants” as people who produce food on a small scale, for themselves or for the community, possibly selling a part of it. This also includes agricultural workers. We support and encourage people to stay on the land and go back to the countryside. We promote food sovereignty (as defined in the Nyéléni declaration) and peasant agriculture, particularly among young people and urban dwellers, as well as alternative ways of life. In Europe, the concept ‘food sovereignty’ is not very common and could be clarified with ideas such as ‘food autonomy’ and control over food systems by inclusive communities, not only nations or states. We are determined to create alternatives to capitalism through cooperative, collective, autonomous, real-needs-oriented, small-scale production and initiatives. We are putting theory into practice and linking local practical action with global political struggles. In order to achieve this, we participate in local actions through activist groups and cooperate with existing initiatives. This is why we choose not to be a homogeneous group, but to open up to the diversity of actors fighting the capitalist food production model. We address the issues of access to land, collective farming, seed rights and seed exchange. We strengthen the impact of our work through cooperation with activists who focus on different tasks but who share the same vision. Nevertheless, our openness has some limits. We are determined to take back control over our lives and refuse any form of authoritarianism and hierarchy. We respect nature and living beings, but will neither accept nor tolerate any form of discrimination, be it based on race, religion, gender, nationality, sexual orientation or social status. We refuse and will actively oppose every form of exploitation of other people. With the same force and energy, we act with kindness and conviviality, making solidarity a concrete practice of our daily life. We support the struggles and visions of la Via Campesina, and work to strengthen them. We wish to share the knowledge and the experience from years of struggle and peasant life and enrich it with the perspectives and strength of those of us who are not peasants, or not yet peasants. We all suffer the consequences of the same policies, and are all part of the same fight. I ddarllen yr erthygl yn y Gymraeg cliciwch yma. 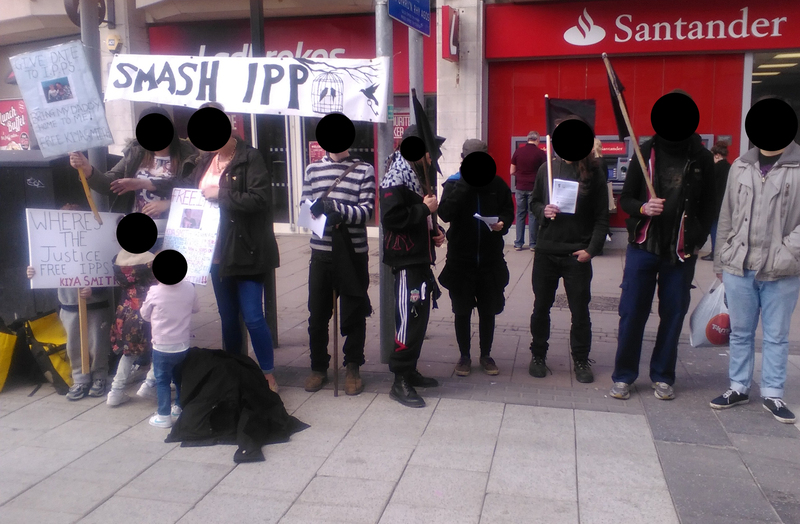 On Saturday the 4th of April 2015, the Smash IPP group held their first a demonstration in Cardiff. For those of you who do not know what IPP is, it is an indeterminate sentence for public protection. This allows the court to add time onto an existing prison sentence often for minor crimes and therefore pushing back the release date indefinitely. This means that IPP prisoners live under the constant mental torture of having no release date. It was abolished in 2012, however this was not done retrospectively leaving more then 5000 people in jail for a non existing law with no release date. At 2pm the group gathered at the Aneirin Bevan statue on Queen Street. We were joined by friends and family members prisoners under the IPP sentence. We stayed at the statue for about an hour handing out leaflets and talking to the public about IPP sentences as it is not a very well known subject. We then marched down queen street with black flags and banners. 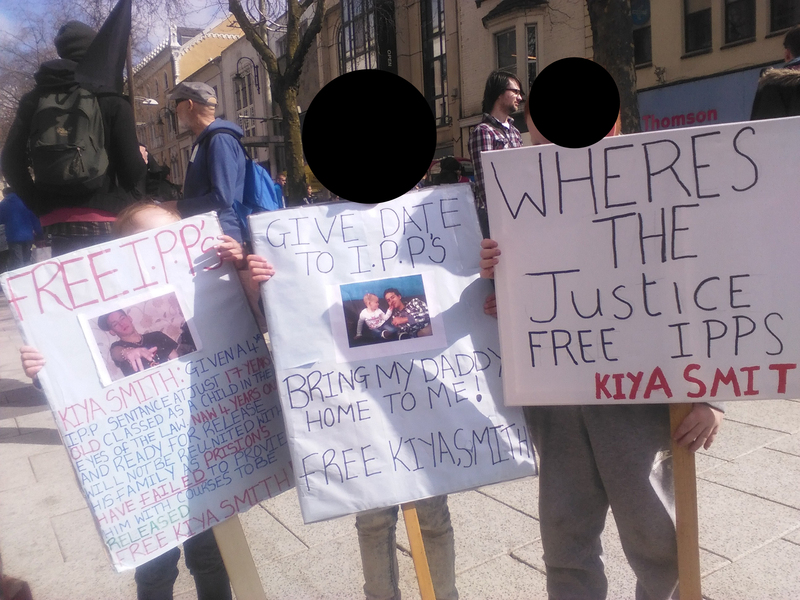 Everyone, including children who were marching with us, took turns chanting Smash IPP, Set them Free and Our Passion for Freedom, is Stronger then their Prisons. We arrived at the prison entrance where we were joined by others who were visiting loved ones in prison. We continued to chant things like Freedom for all, Tear Down the Walls. We then we went to the top floor of the a nearby car park where there was good visibility. We could see the prison cell and the the prisoners could see us. 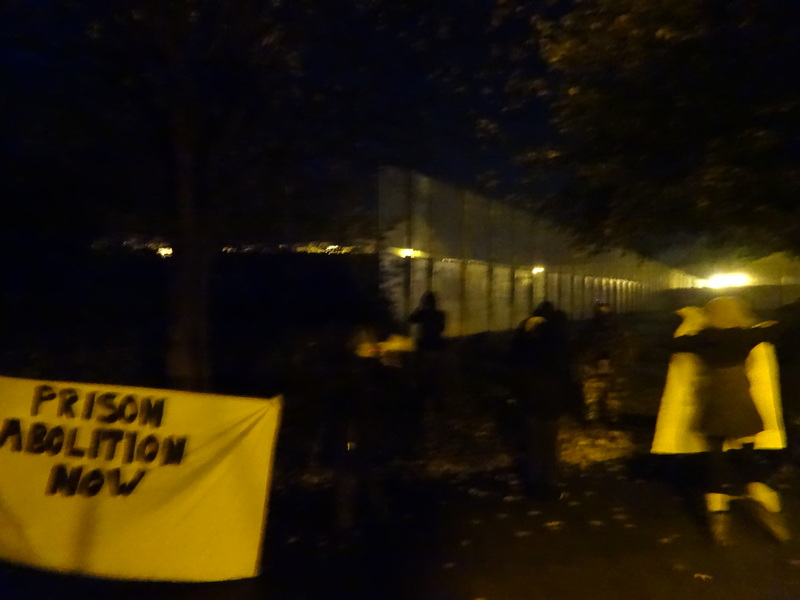 We hung banners, chanted and communicated with people in the prison. 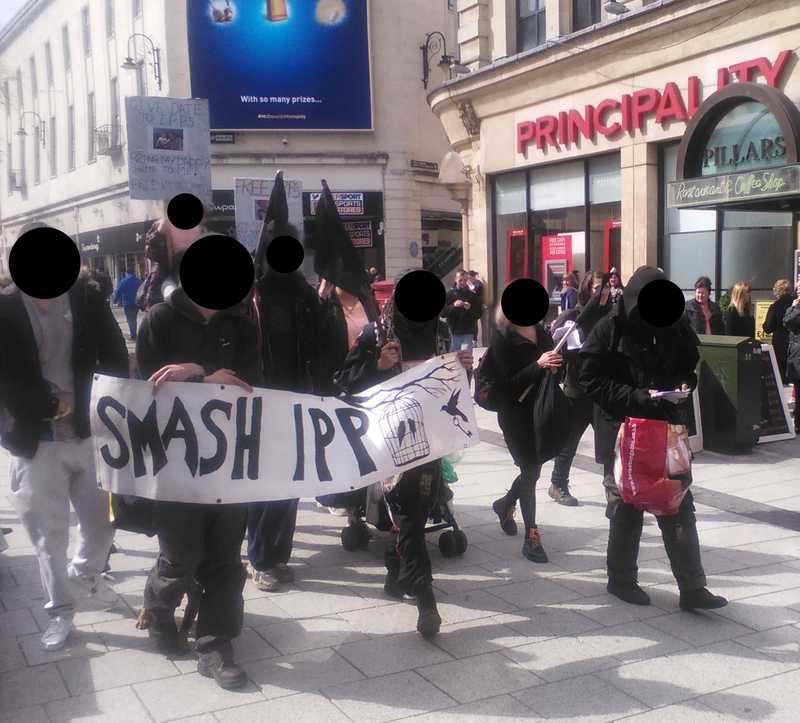 The friends, families and demonstrators kept were still chanting, Give them a Date, Set them Free, Smash IPP!. 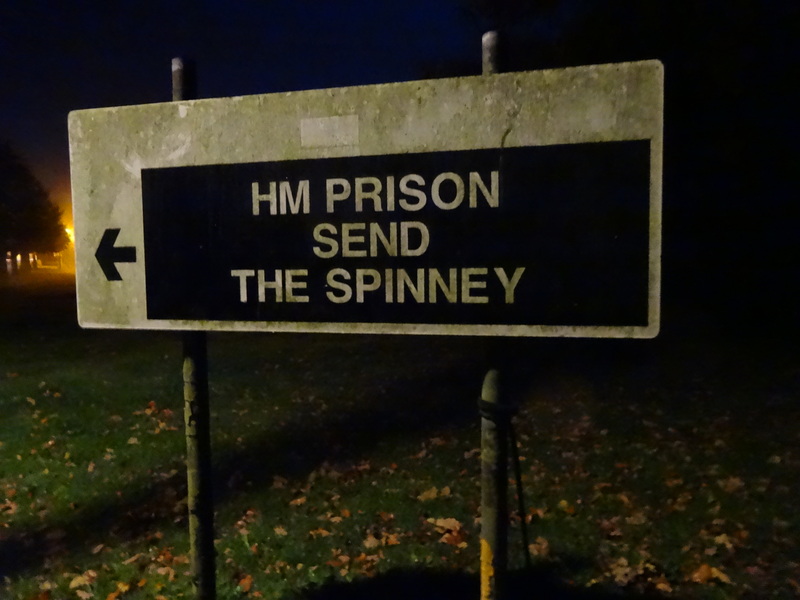 The prisoners themselves sent us signals of their support and asked us to return. There will be more events like this in future. This group Smash IPP is a collective of Anarchists and anti-authoritarians as well as the loved ones of IPP prisoners. We have chosen to stand against IPP because it is one of the most blatant abuses by the state of the justice system in order to punish those it deems criminals, while some of the worst crimes of all are begin committed by the cops, judges and screws.